The Santa Clara Pueblo is separated from its closest neighbor—San Ildefonso Pueblo—by the Rio Grande. The geographic proximity of these Pueblos is reflected in the similarity of work produced by San Ildefonso and Santa Clara pottery artists. 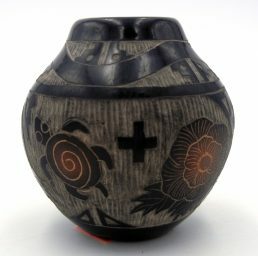 Like San Ildefonso Pueblo pottery, Santa Clara pottery artists created black-on-black and red vessels. Some pieces exhibit the same matte over glossy finish developed by Maria and Julian Martinez. 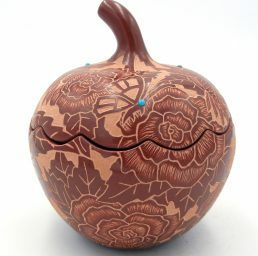 But, Santa Clara Pueblo pottery artists have developed their own trademark styles and designs that distinguish their art from their neighbors’. 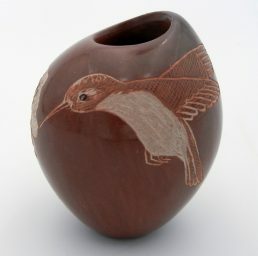 Santa Clara Pueblo pottery artists rely on etching, carving and sgraffito to create designs rather than painting them. 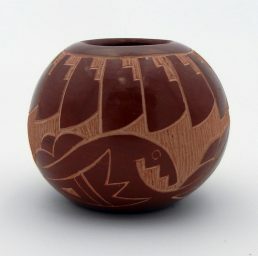 The avanyu, or water snake, is a common pattern, but Santa Clara Pueblo pottery artists also favor hummingbirds, butterflies, dragonflies and floral patterns, many of which incorporate small stones for colored decoration. 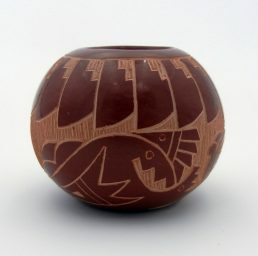 Santa Clara Pueblo pottery artists are creative in the shaping of their vessels, which are often not symmetrical from top to bottom. 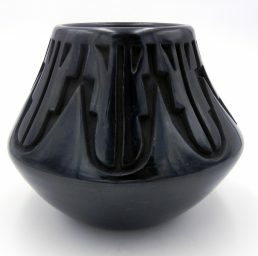 While the body of jars, pots and bowls are traditional ollas, the mouth of the piece may be polygonal or fluted rim. 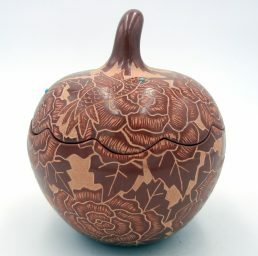 There are not so much individual renowned Santa Clara Pueblo pottery artists as there are renowned families. 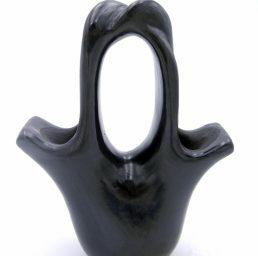 The tradition of pottery making has been handed down through several generations, and often siblings are equally prolific and as celebrated as their parents. Among these artists are the Tafoya, Naranjo, Suazo and Gutierrez. 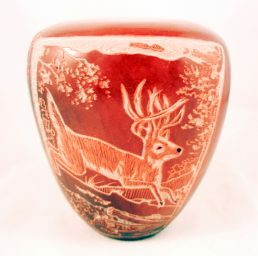 The Begays are also notable Santa Clara Pueblo-style pottery artists whose work incorporates some of the pottery styles and designs reflective of their father’s Navajo heritage. 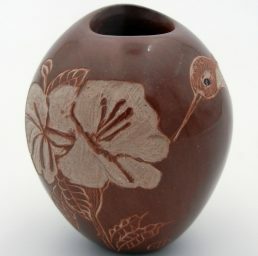 Palms Trading Company has been buying pottery art from Native American Indian artists since the 1970s. 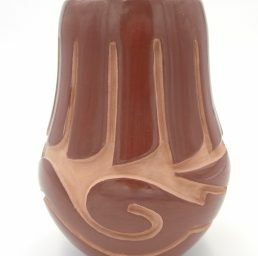 Each piece created by the Santa Clara Pueblo pottery artists is authentic, hand-coiled, carved or etched and polished. 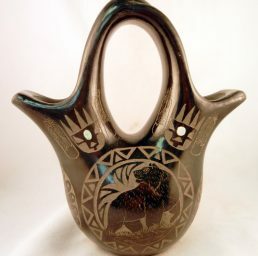 The demure yet intricate style of the Santa Clara Pueblo pottery artists makes any one of these pieces a naturally stunning accent to your home décor. 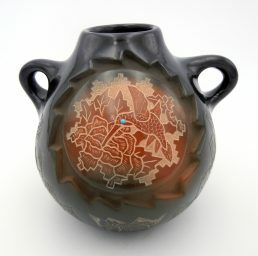 If you would like to add Santa Clara Pueblo pottery to your collection but don’t see quite what you’re looking for on www.palmstrading.com, please contact us. Our personal shopper can show you more pieces from our in-store selection.